Although often quite disabling, DD is not a serious or life threatening disease. Over months to years the skin of the palm becomes lumpy and thicker, gradually forming rope-like "cords" which starts to pull the fingers into the palm such that you can not fully straighten your fingers. 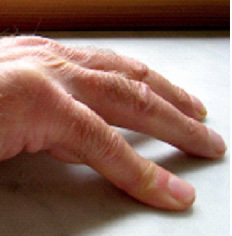 How does Dupuytrens disease develop? Patients usually first notice a painless lump developing in the palm (bottom left picture). These lumps of DD are called "nodules" in which a type of cell called a fibroblast can be found. Fibroblasts produce collagen fibres (a common structural protein) which when laid down in excess start to organise themselves into the rope-like "cords" leading up to and into the fingers (right hand picture). As these cords contract they pull the fingers into the palm, bending the joints such that the finger can not be fully straightened. DD normally first develops on the little finger side of the hand, but as it progresses may also affect the thumb side of the hand. 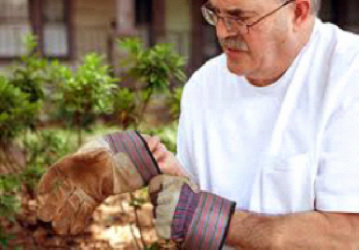 Some patients also develop lumps over the knuckles called "garrods pads" (top left picture), and "pits" in the palm where the skin has been pulled down deeply. 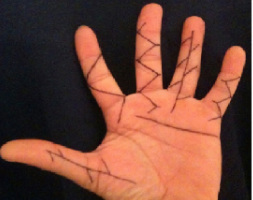 In fact DD is primarily a disease of the lining of the palm under the skin (called the palmar fascia) but sticks to and involves the skin over time. 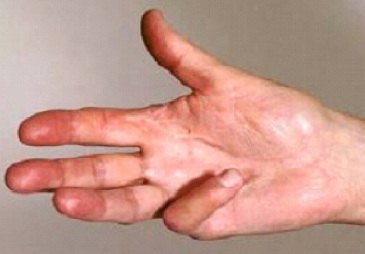 How might Dupuytrens disease affect me? - find the nodules are painful on gripping objects, or the finger becomes sore when it catches on objects. What can I do, and when should I seek help? This is a very personal and individual dicision. If you are a smoker then stopping smoking will help slow the progression. It then comes down to whether the DD is interfering with your life such that you want to do something about it, and how much time you want or can take off for treatment. Some treatments take longer to recover from than others. 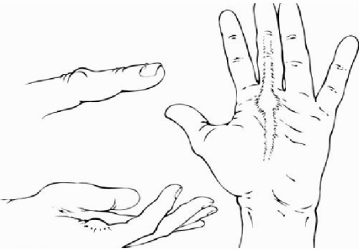 Medical text books suggest that you should consider treatment if there is a slight bend (greater than 30 degrees) at the joint at the base of your finger by your palm (the MetaCarpo-Phalangeal Joint = MCPJ) or any bend at all at the middle joint in the finger (the Promimal Inter-Phalangeal Joint = PIPJ). However a useful home test is the "table-top" test in which you try to put your palm down flat on a table. If you can't (as in the picture) then it might be time to consider some form of intervention. What are the treatment options for Dupuytren's diease? Each level, 1 through to 6, prolongs the length of time before the DD recurs after the treatment, however with each level the recovery time is longer, and there is a higher risk of complications.